This is my second project. Hope you like it. Don’t like the blue lights too much though, I feel like they cheapen it. IMHO. Seeing that only a drum made it to the Gallery then this is a given for it too. Work on the lightning a little more. Watch a picture of a stage or similar. Why not give it in a garage lightning. Oh yeah. This is definately headed to the gallery. Five stars. Awesome picture! Modeling, shading, lighting, everything is perfect! How do you get that “light-beam” effect? Are those just semi-transparent cones, or what? Its really not very good. 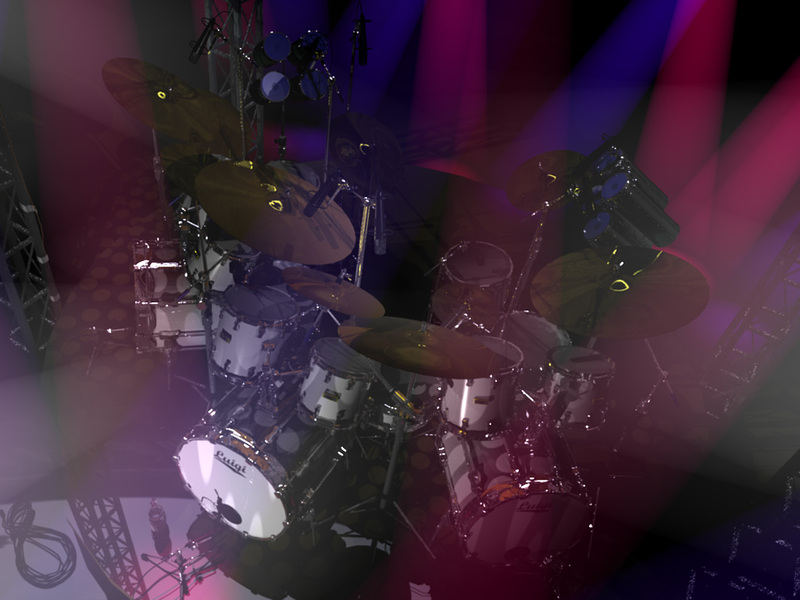 Id drop the spotlights for a bit(they are kind a blocking out the drums, and confusing the scene), try some soft shadows(area light, though buffer shadows work). Id also turn on AO(which doesnt seem to be on). That’ll addd a ton to the realism. Other than that, its really amazing, defiantely gallery material. Could we maybe have some drums-on-gray-plane-with-AO renders? Just to show off the model. That’s pretty awesome in general, but the spotlights don’t really do it IMO (not necessarily your fault; that’s just what blender’s ‘spotlights’ look like). Also, it looks slightly blurred (could be the monitor i’m on at the moment) as if you rendered it with the gauss filter. If you’re willing to do a re-render, try it with the mitch filter set from about 1.0 - 1.10, and you’ll get a crisper look. And of course, as free ailty mentioned, use AO if it’s not already on. No rating for now, but I’d give this 4 stars. I’ll take a look at this later on a good monitor and re-evaluate. Depending on that, and whether you update/tweak, I just might give it 5;). EDIT: Oh yeah, and the stage is a bit reflective… if it was brand new it might look like that. Usually they’re pretty scraped and scuffed though. I’d give the stage a blurry reflection and the drum metal a semi blurry reflection with a new SVN build. I hate to differ from the rest here, but the way the lights and drums relate here makes it look a little chaotic, the lights get in the way a little. I’d prefer a few bright lights without halos to emphasize the model better, and if you use an SVN build you can make the shadows soft. The drumset model is decent though. Yes, the difficulty right now is simply that it is quite difficult to see it. Wow, thanks for the responses guys. I really take on board the constructive criticisms about the lighting. I will try some of your ideas and I’ll rerender and repost it in a few days. It’s great to get fresh opinions as it keeps you thinking. I can’t wait to get back into it. Just in answer to Livewire’s question, all you need to find in the material buttons is a little button marked HALO. Of course you must have your light selected, and you should make your light a “spotlight”. Your beam will then show up as if there was smoke or dust in the room. To study this further you should look out for tutorials on Volumetric Lighting. Thanks again, AO here I come.